Inside, you’ll find a large showroom for wallpapers, blinds, curtains and all their accessories, as well as an extensive choice of trade and designer paints and various decorating sundries and equipment. We also have a kids’ area, a welcome relief for parents bringing children on their visits. Brewers has always been about good service as much as the products, and we take a great deal of pleasure in building long-term relationships and sharing our technical product knowledge if ever you need advice. 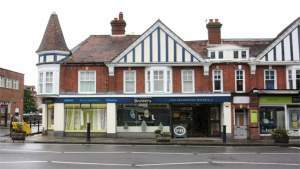 Haslemere’s Brewers Decorator Centre is right on the High Street. We’re next to HSBC, separated only by a road that leads to our dedicated customer parking and rear entrance. We’re lucky to be in a rather beautiful, turreted building.